Earlier in the week, we made a trip up the M5 to visit the science museum At-Bristol. I had planned to visit At-Bristol with my eldest, who is 7 years old, at some point this year, but had envisaged it as a trip with just him and me. I was a little nervous that the museum might not be entertaining enough for my younger two, who are 4 and 2. How wrong could I be? Despite the fact that it was half term, the museum was not as packed as I thought it might be - although it was busy. We arrived late morning and had not pre-booked tickets, but there not that much of a queue to get in. And once we entered, instead of being shunted along through the exhibits as you often are at these attractions, the open-plan and airy design at At-Bristol meant that you could choose to flit from exhibit to exhibit, choosing the areas that were least congested. 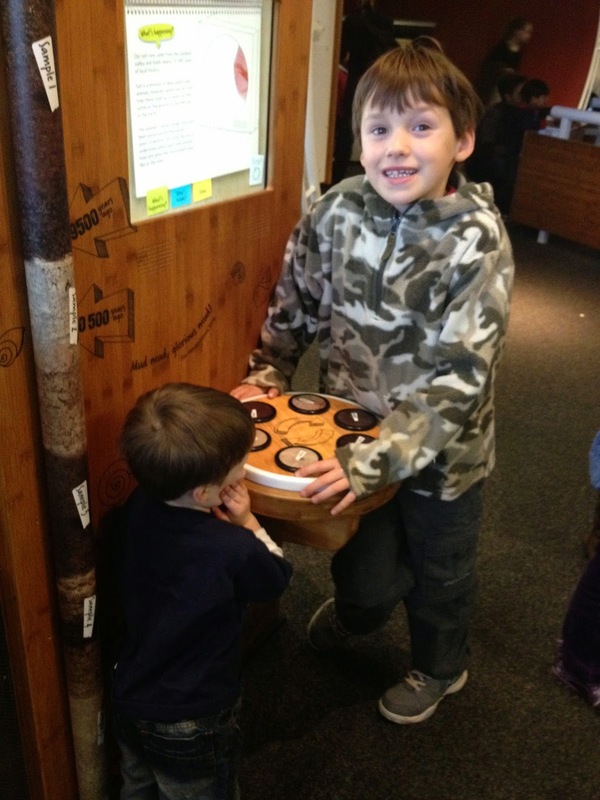 While 7-year old E, who can read, was able to really get into the displays, 4-year old B appreciated the highly visual elements and 2 year-old W enjoyed pressing lots of buttons. something from the cafe. I had prepared a packed lunch, but when I saw the prices of the hot food available in the cafe, I opted to buy lunch there and use the prepared sandwiches later for tea. Especially, as the price was further reduced when I used my Gift Aid vouchers to get money off the bill. E really enjoyed his sausage, chips and beans. But B and W were less thrilled with the pasta option. And when I tried it, I realised why. The tomato sauce was pretty bitter and it really could have done with a cheese topping. keep an eye on them all without panicking about losing a child. B and I sloped off for about 20 minutes to make an animated film, while my sisters watched the others. The wristband really came into its own here and once we'd made the film, I just had to enter my email address and it was sent home so we could show daddy. collecting pollen and some of the younger ones spent time milling their own flour, while the older ones headed back up to the second floor flight deck for an activity aimed at 8 year olds. By this time, it was getting late, so we prepared to make the journey back to Devon. I had been dreading the travelling, but actually, getting to At-Bristol was a doddle. When the trip was first agreed, a trek up to Bristol on one of my only two free days in half term was not exactly top of the priority list, especially as we had a dentist appointment at 9.15am. But my sister, who blogs at Ink Spots and Grassstains, recently moved to Herefordshire, so Bristol is conveniently in the middle for half-term family get-togethers. Normally, we would have taken the train, but because of the dentist appointment, we opted to drive. I was dreading the trip up the motorway and into Bristol. But was pleasantly surprised by the ease of the Park and Ride just off Junction 18 of the M5. We literally pulled off the motorway, into a car park, paid £3 for our return tickets and the bus stopped right outside the museum. Simple. The only issue was that the park and ride on the way home was absolutely packed and we couldn't get on the first bus. It was rush hour. But when we did get on a bus, I was extremely grateful to the kind people who gave me and the children a seat. At 34 weeks pregnant, and after a long day on my feet, it was exactly what I needed. So if you're looking for a family day out in Bristol, I would recommend At-Bristol as an ideal option for all ages. Where have you been this half term?